Aircraft: An aircraft is a machine that is able to fly by gaining support from the air. It counters the force of gravity by using either static lift or by using the dynamic lift of an airfoil, or in a few cases the downward thrust from jet engines. 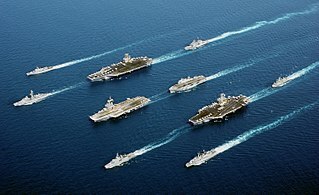 Aircraft carrier: An aircraft carrier is a warship that serves as a seagoing airbase, equipped with a full-length flight deck and facilities for carrying, arming, deploying, and recovering aircraft. Typically, it is the capital ship of a fleet, as it allows a naval force to project air power worldwide without depending on local bases for staging aircraft operations. Aircraft pilot: An aircraft pilot or aviator is a person who controls the flight of an aircraft by operating its directional flight controls. Some other aircrew members, such as navigators or flight engineers, are also considered aviators, because they are involved in operating the aircraft's navigation and engine systems. Aircraft engine: An aircraft engine is a component of the propulsion system for an aircraft that generates mechanical power. Aircraft engines are almost always either lightweight piston engines or gas turbines, except for small multicopter UAVs which are almost always electric aircraft. Aircraft flight control system: A conventional fixed-wing aircraft flight control system consists of flight control surfaces, the respective cockpit controls, connecting linkages, and the necessary operating mechanisms to control an aircraft's direction in flight. Aircraft engine controls are also considered as flight controls as they change speed.